An extraordinary year in which American democracy and American slavery emerged hand in handAlong the banks of the James River, Virginia, during an oppressively hot spell in the middle of summer 1619, two events occurred within a few weeks of each other that would profoundly shape the course of history. In the newly built church at Jamestown, the General Assembly--the first gathering of a representative governing body in America--came together. 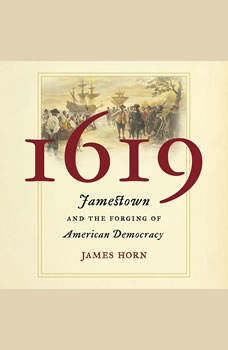 A few weeks later, a battered privateer entered the Chesapeake Bay carrying the first African slaves to land on mainland English America.In 1619, historian James Horn sheds new light on the year that gave birth to the great paradox of our nation: slavery in the midst of freedom. This portentous year marked both the origin of the most important political development in American history, the rise of democracy, and the emergence of what would in time become one of the nation's greatest challenges: the corrosive legacy of racial inequality that has afflicted America since its beginning.